The number three takes a prominent numerical place in our faith, evidenced in our mythology, all Indo-European myths, symbols, theology and culture. 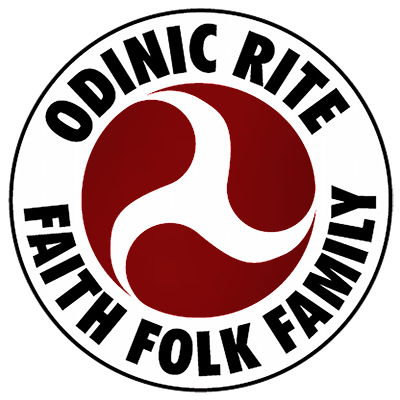 The simple and organic numerology symbolised in the trefot symbol of the Odinic Rite serves to illustrate a basic theme of our troth and culture, that of functionalism, namely trifunctionality. The great Indo-European mythologist and scholar, George Dumezil popularised trifunctionality in his writings; “The Tripartite Ideology of the Indo-Europeans;” “The two sovereigns of the Indo-Europeans;” and “Gods of the Ancient northmen.” Dumezil, as many of you will know, discovered a common tri-partite or trifunctional structure in most Indo-European theological pantheons. The first function is the sovereign or kingly function, often shared by two divine functions, the judge and the priest. In German myth this would be Tyr and Odin. The Christians consolidated both to conform to the biblical deity Yahweh, but gave him the declined form of the Gothic name of Odin (which is Goden or godan, declined to ‘God’).The second function is the warrior class, ruled by Thor and the third function is the provisional class of fertility deities: for our faith this would be the Vanir. Our ancestors of many cultures applied this trifunctionalism in naming the days of the week. These names of our days (along with the “Christmas” tree, Easter, etc.) stand as the religious slippery slopes of arguing against Christianity and monotheism. Tuesday and Wednesday represent the two sovereign functions (Tyr and Odin), Thursday symbolises the second function of the martial class deity Thor and Friday is the third function of the fertility divinities (the Vanir). The other European languages share the same nomenclature in the names of their weekdays as well. For example in Latin languages, these days also honour the sun, moon, Mars, Jupiter and Venus. This makes one wonder as to the ideological purpose in assigning these functions to these particular days. What tradition or custom did they incorporate? Should we live accordingly? Can we? One note of interest is the diarchy of the two first – functional sovereign Gods (as opposed to a monarchy)- who have been shown to illustrate the judge and priest/philosopher roles or more technically, temporal power and spiritual authority. One must ask why then is our religion called Odinism instead of Tyrism? I believe it is because he is more spiritual, less temporal; he comes from the dark whereas Tyr’s is of the light (his name, as well as that of Zeus stems from the Proto-Indo-European deywos, ”one of the daytime sky”) and dark always precedes light. This principle exists on many levels from discovery, to scientific induction, to the spiritual awakening process; the Odic Force is ever on the threshold. Tyr uses the sword, Odin is the pen, action backed by thought. The trefot symbol of the OR is quite a symbol of wisdom. So much can be seen in it. A plethora of examples will suffice. Our folkish (male, plus female) Being is three-fold; body, mind, spirit, and in that order too, for the beginning of life is spent growing the body, the mind and finally the spirit which is eternal. This corresponds also to the three main periods of the day; morning, afternoon and evening. The body should be exercised in the morning, the mind in the afternoon and the spirit in the evening. This is further illustrated in our holy days of Ostara, Midsummer and Yuletide. In the area of epistemology the three levels of knowledge can be seen in the trefot: conception (reason/logic), perception (obser-vation/mythos) and intuition (introspection/faith) which can likewise be felt and seen in the hammersigning ritual, (touching the head, heart and shoulders in the shape of the mjolnir. And also in psychology in the two hemispheres of the brain together with the emotive lower “reptilian” brain. The OR structure itself is trifunctional in terms of its three levels of functional membership: 1) Individual/Hama; 2) Hearth; and 3) Garth/Organisation/Theod. In our theology we have three heavens; Alfheim, Vanaheim and Asgard. A symmetrical reflection from the three heavens can be seen in Yggdrasil’s three wells; Hvergelmir, Mimer and Wyrd. The last two represent the two sovereign functions of thought and action. The first well being dissolution and organicism. The counter part to the conscious-building heavens are the three realms of giants: Niflheim, Muspelheim and Jotunheim symbolising anti-matter (thought), energy (action) and consumption (dissolution, absorption and nutrition). The three aettir of the elder Futhark have a mystical, hermetic trifunctionality of their own. The Indo-European mythologies have an uncommon position of religious authority in the guise of three female divinties. In Greek myth these fate sisters are the Moirai, in Roman myth the Parcae and in Germanic myth the Nornir; Urd/Being, Verdandi/Becoming and Skuld/Overcoming. In Western philosophy and theology a German philosopher, G.W.F. Hegel- an idealist- came up with a process of reasoning known as dialectics which was also covered by earlier Greek philosophers. Simply put “the process is one of overcoming the contradiction between thesis and antithesis, by means of synthesis in turn becomes contradicted and the process repeats itself until the final perfection is reached.” Dialectics is a running theme in the philosophies and theology of our folk. Our Holy God Odin is the synthesis at the head of trifunctional development in all areas of Being, life and death. He resides within us and outside us in continual process of betterment. When our wills are in tune with his we advance, and are less dysfunctional. The trefot, such a simple symbol, signifies a wealth of wisdom. How fortunate we are to have it as the trademark of our Rite and Religion. Sturluson, Snorri, Edda, Faulkes Trans., 1987, London, Everyman Pub.